I'm thinking about getting a new bike to mostly commute around the city, but also to ride around the countryside and maybe on some unimproved/dirt roads and such. I don't plan to take any long trips, mainly just day trips, some highway riding, but not too much. I don't want a big heavy bike, just a good versatile all purpose bike with an upright riding position. 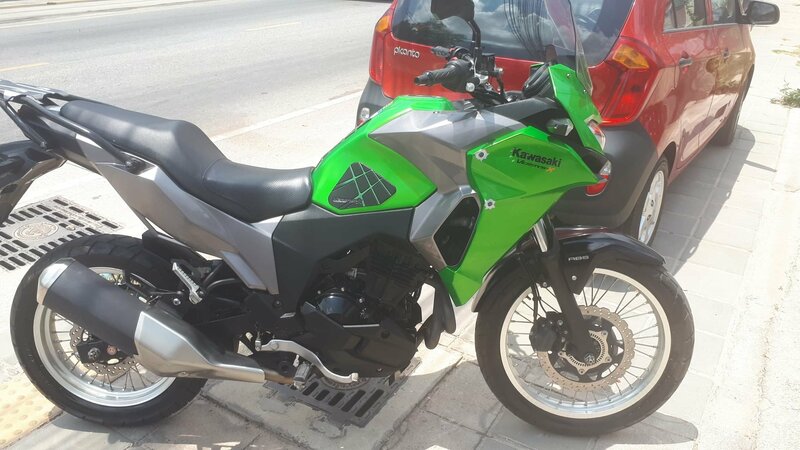 I'm interested in getting the Kawasaki Versys-X 300, but don't know anything about it personally, just what I've read on the internet and through YouTube videos. It has a lot of positives with the negatives being a very hard seat and the high revving engine especially at highway speeds. Does anyone have any personal experience with this bike such, an owner or previous owner? A second alternative would be the Honda CB 500X. Kawasaki Versys-X 300 or Honda CB 500X. I advise you to try both the difference is price and weight and what you like. I would go CB only 20 bags of sugar heavier and I think about 20,000 baht. Honda CB500x, you can not go wrong with that one if you plan to go 250km + or more in a day countryside. With a 300, you will feel a need for an upgrade quite soon, and the price difference is peanuts. Anyway, two great small semi adventure bikes, and can not go wrong with either of them. I don't own one but have a friend that does check Ian Wheldale Thailand Life on YouTube.He bought one last year and has done a couple of reviews on it as well as using it for his you tubing videos. he is very pleased with it by all reports. Thanks for your replies. I currently ride a Honda CBR 150R, decent bike, but underpowered, stiff suspension, feel every bump in the road and uncomfortable forward leaning riding position especially for anything other than city rides. I really wasn't looking for such a bike, but I was able to buy it from my next door neighbor on the cheap with very low mileage. I've read some poor reliability and build quality reviews on the BMW and costly service and repairs. Also, I want to get away from a single cylinder thumper and opt for a parallel twin for overall smoothness and power. I don't ride all that much so I'm more interested in picking up a low mileage second hand model versus purchasing new. I agree that both models seem to fit the bill, Versys maybe better for off road use and the CB 500X on road. I've sat on both and like the ergonomics, seating position of both although the CB 500X has a more comfortable seat. I've ridden an order model 2013 CBR 500R before and it was a nice comfortable ride with a little forward lean, but not so much as the CBR 150R I have now. I have seen Ian Wheldale's YouTube videos discussing his Versys-X 300 along with many others. As has been suggested, I guess I need to give both bikes a ride, but I do find that available second hand models of both seem to be few and far between, but I'll keep looking, thanks. , but I do find that available second hand models of both seem to be few and far between, but I'll keep looking, thanks. Just down the road from you - in Neunplub wan (just down ftom the Temple, on the way towards the Siam Country Club crossroads).. I did see this one advertised for sale already; thought I would check it out over the weekend or next week following the end of Songkran. I know you have mentioned moving up in power and cylinders. But there is quite an easy fix for a better riding position. I came into my 150CBR in similar fashion. My late wife bought it for me as a surprise. So I was determined to make it work. Bought a new seat so I could always bring it back to original. I repadded the seat into just about a bench only marginally less high than the pillion. Changed the bars. Installed Phantom risers and a motocross bar and longer cables for clutch and brakes.. It has made the world of difference for me quite comfortable. I am 191cm tall and 120kgs large. So the power is not great but I don't like to go too fast anyway so beside having to gear way down in the mountains (hills) I find it adequate and workable for me. Thanks Randell for your input, an interesting alternative. I'm 180cm and 75kg so the seat height as far as seat height to ground is good for me, maybe could raise it a little, but as you know, the footpegs are a bit under the rider so there will still be a significant bend at the knees when riding. I would like for the pegs to be a little more forward for comfort. I was at the Honda dealership a few weeks ago and asked about raising the bars, didn't cross my mind about replacement bars. Anyway, I was told that I could not use risers with the clip-on type bars. I remember when I had sat on the CBR500R, it had more of an upright position than the CBR150R and less knee bend; I guess that size matters. I would be interested to check and see if the CB500X bar and risers could be fitted to the CBR150R. I would still like to have a slightly larger bike, smoother running with less vibration and more power, but your recommendations do make a lot of sense especially since my bike is in excellent condition with low mileage, under 750km total. I've change the oil on it a couple of times, but in all actuality, I haven't even completed the break-in and reached the first scheduled service. It would be interesting to see a couple of pictures of your bike mods. Like you, I don't like to ride fast either, but I do like to ride comfortably, wouldn't mind a little softer suspension, but you get what you get when riding a relatively lightweight bike designed to mimic that of a sports bike. Just buy the proper tool for your purpose! 150 will work fine, but still, when you first experience the extra power a 500 or 650, you will not even think about a 150 or 350 again! I got a 500x and just love that bike. Versys is also good, so you cant go wrong. Either bike with the right choice of tires, will take you the most desired roads and places. I agree, I should have bought the Honda CBR500R in the first place, but I let my wife talk me out of it since my primary use was for riding around town, but having bought the CBR500R, it would have given me more flexibility to venture out of the city for the sheer joy of riding for the fun of it. Before moving to Thailand, I'd never owned a bike under 500cc. My first bike ever was a 500cc Yamaha back in 1973, soon to be traded in for a Triumph Trident 750cc triple. I've owned several other bikes over the years, but when I went to work overseas in 1994, I had moved away from bikes, not a good idea in Saudi Arabia. Before moving to Thailand and following my marriage to a Thai, I bought a 2000 Honda Sonic Nova 125 to putt around in the home village up north; we kept that bike until just recently then about 18 months ago, I didn't ride it much because it just wasn't a good fit for me, too small in size making it uncomfortable to ride. I picked up the Honda CBR150R from my neighbor who was liquidating his collection following his death. I should have gone with the 500, but opted for the 150 based on what I expected its use to be at the time, big mistake in my mind as I passed on a really good deal. The CBR150 does fit much better than ergonomically than the sonic being larger in stature and a taller seat height, but after taking it out on a few longer rides, I find that the seating position, location of the pegs, low clip-on bars putting pressure on the wrists do not make for a comfortable and enjoyable ride. Could I live with it, sure, but should I, there are better alternatives. I may take a look at making modifications to make the bike more comfortable, but after doing so, it still wouldn't make up for the lack of power especially low rpm torque. This bike needs revs to produce its power, max torque around 8500 rpm and max HP around 9500 rpm and requires a lot of constant gear shifting. I feel when riding that I seem to always be in between gears especially around the city. I've come to a point that I would like to ride a little more so why not do it in comfort. I could keep the CBR for city driving and pick up a larger bike for cruising around, but I think I would rather just find one good all around bike, preferable a second hand bike in exceptional condition. I've all along leaned towards the 500cc Honda's, but the Kawasaki Versys-X 300 caught my attention. After watching many YouTube videos, I thought I would seek the opinions of those on this forum who ride in the Thailand environment. Thanks to all who have offered their opinions and expertise.